Ezra Goh (right). Photo courtesy of Goh. This past August, news broke that three principal dancers at New York City Ballet (NYCB) were fired for sending highly inappropriate text messages. A few weeks later, the dance world at large was shocked and sickened to learn exactly what those text messages said. Suffice it to say, the content was highly sexually demeaning, derogatory, and defamatory in nature. Much has been discussed and debated in regards to what happened there. Dance Informa would like to focus on the “what to do” aspect of the matter, rather than the “what not to do” – on the best we can be, rather than the worst we can be. OnStage Dance Company. Photo courtesy of Jennifer Crowell-Kuhnberg. How do we work together in dance companies with integrity? How do we build trust? Why, exactly, does doing those things matter? As such, we spoke with one dance administrator and teacher, one performer and teacher, and one movement-based mental health professional to get various informed views on the matter. 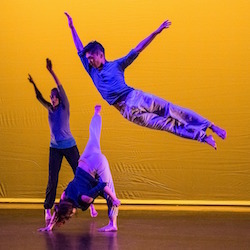 These three are Tammy Smith, board-certified Dance/Movement Therapist (BC-DMT) and Licensed Mental Health Counselor (LMHC); Ezra Goh, New York City-based dancer and educator; and Jennifer Crowell-Kuhnberg, Boston-based dance teacher and founder/director of OnStage Dance Company in Boston. Proper action most often starts from proper values. What values seem most important toward acting with integrity in dance companies? Which values will help build a creative atmosphere wherein all involved have the potential to thrive? How do we build those values? “Trust and respect are the two most important things you need when building and growing a team,” Crowell-Kuhnberg affirms. She describes how her company includes 50-70 dancers with a variety of backgrounds – in socioeconomic class, profession and dance experience. Crowell-Kuhnberg explains that her company contract includes a clause about treating everyone respectfully. “It’s embedded in our company culture that gossip and bullying are not tolerated,” she adds, noting that they’ve lost several members over the years who’ve had trouble acting in alignment with the company’s culture of inclusivity, who were critical and judgemental. Crowell-Kuhnberg seems to have no regrets, saying, “I’m proud that OnStage is known as a place that’s welcoming to everyone.” Respect is a key ingredient in creating that welcoming culture. Why might trust be important? This value “is what allows for people to compromise,” Goh asserts. “If there is trust in a team, there will be less argument over small details of the process because [there will be] trust [for] each member to figure it out.” He adds that even if the outcome doesn’t meet expectations, there won’t be resentment. All will believe that all did their best. A feeling of safety is key to building trust, Smith affirms, saying, “I believe when you move/dance with a group you begin over time to naturally build trust.” Communication is most often necessary for that trust to grow, however. “Communication, both verbally and nonverbally, is [also] important to maintain trust,” Smith adds. She describes how, although more empirical research must exist before we fully understand this phenomenon, neurons are firing when two people move together. The mirror neuron system activates. “A lot is happening both consciously and subconsciously,” she explains. Demonstrating the importance of fully open communication, Goh discusses how communication has made a big difference in the experience of dancing for different companies. Ezra Goh (aloft). Photo courtesy of Goh. At one, company members were consulted and their feedback truly heard. For instance, when weather conditions at an outdoor performance site might have made performing hazardous, the directors deferred to the dancers. 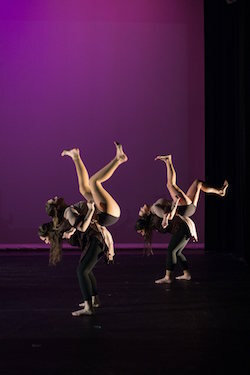 Although the dancers ultimately left it up to the directors, this kind of communication process is most often ultimately beneficial; it “creates space for opinions, but [those involved] also have an awareness and appropriate prioritisation of the authority behind each opinion,” says Goh, adding that, due to the fast-paced nature of the dance industry, there most often isn’t time for every decision to be democratic. Yet a standard of open communication allows all involved to feel empowered to voice their ideas and concerns, rather than fear doing so – which could lead to negative outcomes. Trust, and the increased communication that helps build it, can also evolve from camaraderie – which also has the added benefit of keeping things fun and light, and making everyone more enthusiastic about working together. Crowell-Kuhnberg’s company has a high level of camaraderie, one that’s intentionally created. “As close as people can get in practice, it’s really the ‘afterhours’ time that builds that sense of family and community – we go see shows together, do paint nights, potlucks, brunches and our very popular ‘crafternoons’, and we always have viewing parties at someone’s house after a big performance,” she says, sharing some ideas for how to build camaraderie and team spirit. Building camaraderie does have a practical benefit, Crowell-Kuhnberg shares. “I think that sense of camaraderie shines through in our performances. One of the greatest compliments we frequently get is that we look like we’re having so much fun on stage, and that’s because we also have so much fun off stage.” At the same time, it’s important to respect people’s time and boundaries. If dancers feel forced or pressured into such activities, at the expense of other obligations they may have, they may start to feel resentful. For this and other reasons, all of these events at OnStage are optional. More toward what happened at NYCB, another thing to consider is boundaries for men and women who are working together in a dance company. In regards to men who want to be sensitive and considerate in this space, Goh states that there’s really no formula, “no ‘10 ways to not be a toxic man.’” Yet he underscores the importance of truly listening to female dancers, and not making assumptions about what is okay and not okay for them. 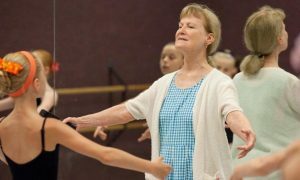 “[Don’t assume] that every female colleague is going to be comfortable with whatever physical boundaries we established with the average female dancer we’ve come across. Be very aware that the lived experiences of men and women in dance is very often vastly different,” he advises. For instance, he says, respect females colleagues’ boundaries if they’re not comfortable sharing a changing room with you. Goh further emphasizes that there are times when male dancers won’t be able to fully relate to the experiences of female colleagues. Yet the important thing is “to give the benefit of doubt that they know what they’re talking about, especially since what they are talking about is their lives,” he says. Crowell-Kuhnberg has some insights in this area for women. “Don’t feel like you have to accept a bad situation or just deal with it, because the culture is shifting and it’s important for all of us to stand up for our rights and our safety, and there is strength and support in numbers.” Some of this does have to do with one’s own personal boundaries and comfort zone. Learning that is part of learning one’s self – as a person and an an artist. “It’s important to know your own body and trust within yourself,” Smith says. “Know the space within as well as around you.” That awareness can lead to outward trust, kindness and effective communication. Those can truly be the seeds of healthy arts organizations. From there, art – and artists – can blossom.